Miss Y. Williams has made a selection of 30 popular rhymes which are not so common for older children. 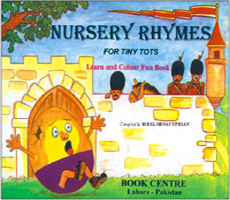 Each nursery rhyme is given on one page and the opposite page shows a delightful colour illustration. 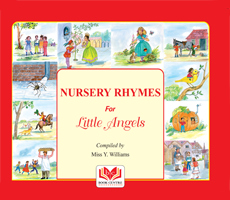 A selection of 22 favourite nursery rhymes in bold letters such as Jack and Jill, Hickory, Dickory Dock; Humpty Dumpty etc. One nursery rhyme on one page and the same rhyme is suitably illustrated in outline on the opposite page for the child to colour.